I've finished my Cotton and Steel project. I've named it Cotton and Steel 1 because I think it's the first of many projects I'll make using that fabric. When I made the blocks I didn't really have a plan on how I would set the blocks, but I figured something would come to me once I got to that stage. an outer borer of half square triangle units. Now I think it looks done. It finished at 63" x 63"
It has approximately 1,525 pieces. A few of you mentioned my half square triangle units. I use the Easy Angle ruler to make my units and have for years. I make mine bigger then square them up. So I think I'm off to a good start. It's been a busy month, but it feels good to have my first project of the year pieced. I hope you're off to a good start in your sewing room. You're off to a great start in 2015! Had to drop in although I got a peek this AM on instagram. You took some weird (bit awkward) print and made a gorgeous quilt. That final border really worked perfectly. Love it. FQS just posted about the new prints for C&S. I will definitely need to add some of THOSE to my stash. 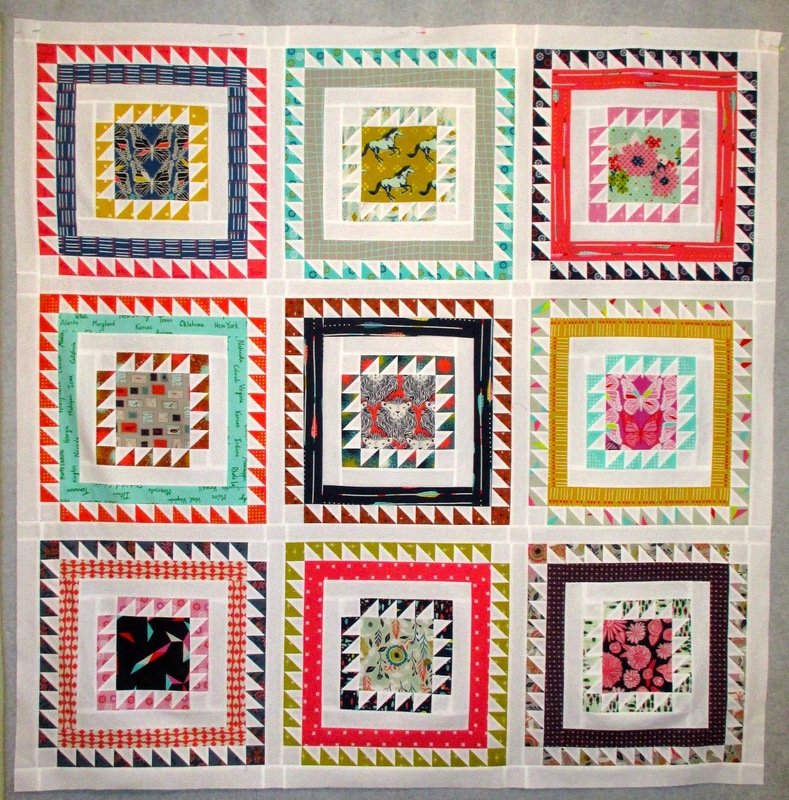 I love this quilt (I'm partial to half-square triangles)! 2015 is looking great for you! Looks great! Love the outer triangle border. Fantastic first finish for 2015! Wow! You really made a stunning quilt here. Awesome! Great finish. Adding the outer border of half square triangles really makes the quilt. I was recently introduced to Thangles for making half square triangles and I love this process, although I've never tried your ruler. I just really love this quilt, and I applaud you for "throwing it together"! It turned out so great! !